Singh, N.J., Katzner, T., Ecke, F., Nilsson, M., Sandström, P., Bagchi, S:, Hörnfeldt, B. Multispecies movement ecology reveals large-scale predator-prey interactions and their demographic consequences mediated by humans. Singh, N.J., Hipkiss, T., Ecke, F., Hörnfeldt, B. Eagles know where the food is: migration of golden eagles driven by food subsidy from humans? Hipkiss, Tim, Edward Moss, and Birger Hörnfeldt. 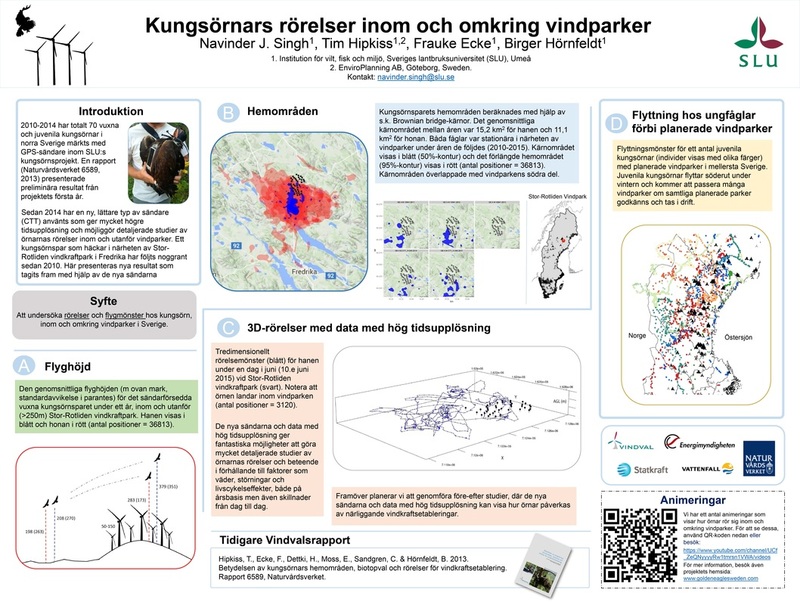 "Variation in quality of Golden Eagle territories and a management strategy for wind farm projects in northern Sweden." Bird Study 61.3 (2014): 444-446. Moss, E. H., Hipkiss, T., Ecke, F., Dettki, H., Sandström, P., Bloom, P. H., .& Hörnfeldt, B. (2014). Home-range size and examples of post-nesting movements for adult Golden Eagles (Aquila chrysaetos) in boreal Sweden. Journal of Raptor Research, 48(2), 93-105. Rebecka Hedfors (2014) Movement ecology of Golden eagles (Aquila crysaetos) and risks associated with wind farm development. Swedish University of Agricultural Sciences, Umeå. Carolin Sandgren (2012) Habitat use and ranging behaviour of GPS tracked juvenile golden eagles(Aquila chrysaetos) . Swedish University of Agricultural Sciences, Umeå. Edward Moss (2011) Golden eagle (Aquila chrysaetos) ecology and forestry. Swedish University of Agricultural Sciences, Umeå. Moss, Edward (2015). Habitat Selection and breeding ecology of Golden Eagles in Sweden. SLU. Kungsörnars påverkan vid vindkraftsetablering Hemområden, biotopval och rörelser. Vindval Report. Betydelsen av kungsörnars hemområden, biotoptval och rörelser för vindkraftsetablering – etapp 2Rapport från kunskapsprogrammet VINDVAL. ISBN 978-91-620-6734-2.